I must admit that there was a time when I was strongly opposed to second-hand chic. I blame it on my hand-me-down childhood. New clothes were a treasure but were hard to come by for this little sis. My older sister, let's call her El, began her growth spurt at about 6 years old and it lasted until she was 16. We’re only 13 months apart so I received all of her wardrobe leftovers. Now El and I are quite different in terms of style of dress: she is/was obsessed with Breakfast Club and went through a Molly Ringwald inspired oversized-mens-dress-shirts-with-tie-and-vest moment while my comfort zone called for t-shirts and jeans. In addition to our differing clothing choices, we also have very different body types. She has always had a slender frame with long arms and legs and I have a bit more padding (more to love?) on a shorter frame. At times my clothing options were pre-picked and pre-stained. I did what I could to take wrinkled up lemons and turn them into style appropriate lemonade, but along the lines of body shape, I was also forced to learn the importance of sizing categories. For example, a girls slim (as inherited from El) does not have the necessary features to accommodate abundant, a.k.a thick, thighs as well as a girls husky. Long story, but I share this so you understand that I am not supposed to enjoy purchasing or wearing someone else’s clothing. Perhaps my sentiments changed during college when I was beyond broke, but I can't quite pin down the exact turning point. Unfortunately, and as usual, maybe my parents had it right all along. And just as a point of clarification, in case Mom and Dad make their way to this post, I am not scarred or debilitated in any way from receiving said hand-me-downs; I enjoyed my childhood and I was well taken care of, well fed, etc. and so forth. Now, back to the business at hand. This is basically a public service announcement encouraging you to hit up your local thrift store for seasonal updates, wardrobe must-haves, and ideas. There are also purses, belts, jewelry, and scarves galore so just allow your imagination to run wild and free as you explore the possibilities. For those out there who need some visual proof, here are two of my recent finds (sorry if the pics are a bit small but I promise, both dresses are adorable). 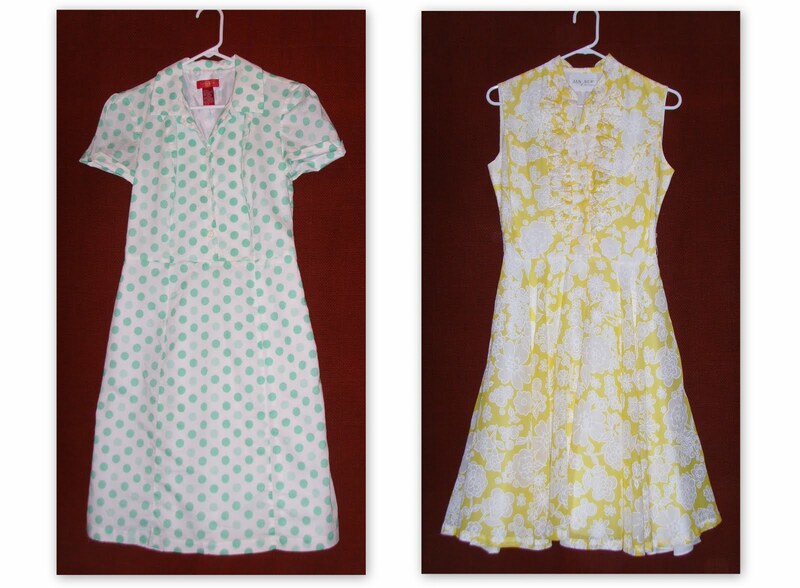 the green dots dress was purchased in L.A. and the yellow floral dress was S.F.